This bread was inspired by a situation that occurred a few weeks ago. Fuzz had a friend over for an all-day visit, but when lunch time rolled around, I wasn’t able to make the friend what she wanted — a simple peanut butter and jelly sandwich. I had tons of peanut butter and even some grape jelly, but the only bread was a bag of high fiber English muffins. By that point it was too late to make white bread from scratch, but it gave me the idea to make bread and over the next couple of days I tried some different recipes. We liked this one the best. Now we just need to invite Fuzz’s peanut butter & jelly loving friend over for a taste test. I think she’ll approve. 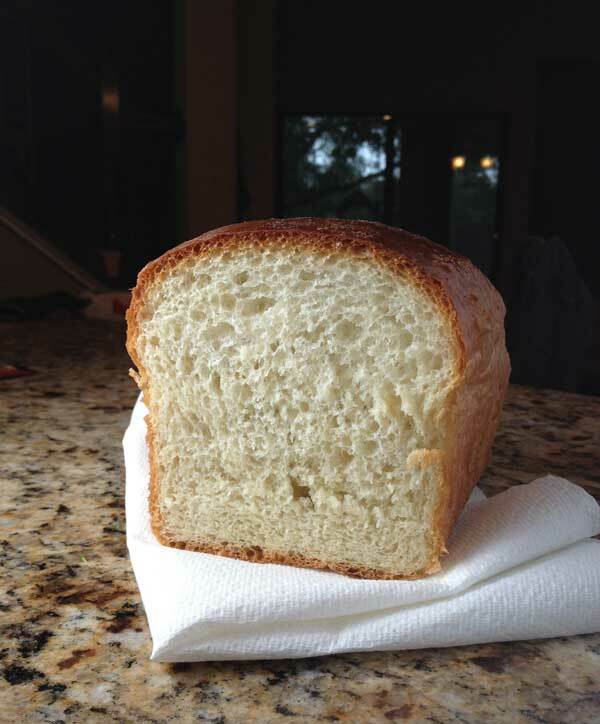 A basic white bread perfect for sandwiches and toast. In a microwave-safe liquid measuring cup, combine the water, milk and butter. Microwave for 1 minute, and then stick a thermometer in the mixture. It should be about 125 degrees or hotter. If it’s hotter, let it cool down to about 125 degrees. In the bowl of a stand mixer, combine 1 cup of the flour, sugar, salt and yeast. Gradually add the 125 degree liquid mixture to the flour mixture and stir well. Add remaining flour 1 cup at a time until you have a dough that is not too dry, nor too sticky. Attach the dough hook to the mixer and knead with the mixer for about 8 minutes or until dough is smooth and elastic. Rub a second bowl with butter. Put the dough in the greased bowl, cover with plastic wrap and let rise in a warm place for 1 hour. Press it down and pat it into a rectangle. Roll into a cylinder and put the cylinder in a greased and floured 8 ½ by 4 ½ inch loaf pan. Put the loaf pan in a warm place and let it rise for 1 hour. Preheat oven to 375 degrees F. Bake for 45 minutes or until loaf is browned and feels hollow when tapped. Let cool completely, then remove from the pan and slice. I can’t get bread flour here so I used regular and got a smaller loaf. Still, I loved the buttery taste and it sliced beautifully. I was surprised to get that nice texture without the use of an egg in the recipe. Thanks for sharing this. This is like a no-knead recipe I have other than the punching down. It looks delicious. How do you keep from eating the whole loaf right out of the oven??? It wasn’t really that noticeable in the actual bread, but you can see it in the photo. I guess the dough on the bottom had less room to expand, while the dough on the top was able to rise more freely and air bubbles got bigger. 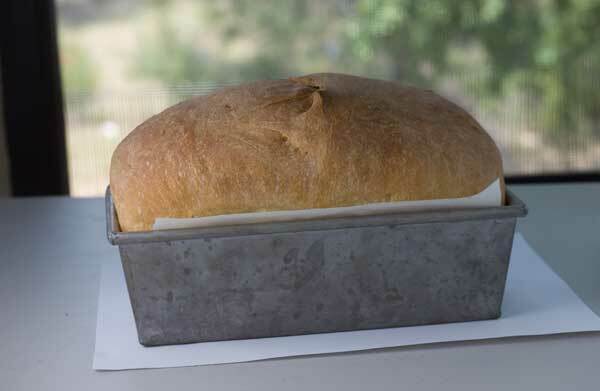 It wasn’t an issue for us, but it reminded me of the existence of those covered loaf pans they sell at Williams Sonoma called Pullman Loaf Pans which make a perfectly square loaf. Using something like that might help make a really dense, even, crumb. I don’t have a bread machine, so this is perfect for me! Allie, thanks for the tip! I think I have that recipe somewhere and will give it a try. Have you tried the America’s Test Kitchen American sandwich loaf? It’s WONDERFUL – and 2 hours from start to finish with no bread machine. 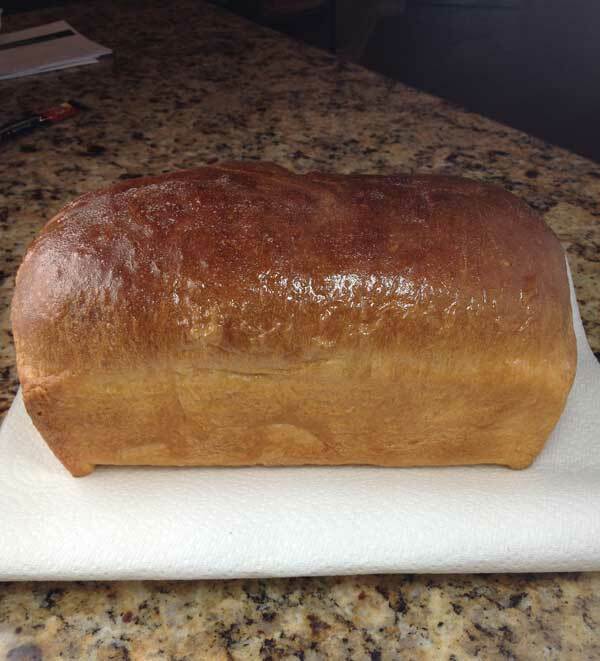 The finished loaf looks beautiful – I bet it would be delicious in French toast.